Raking scattered pine bark mulch back into flower beds. When that happens, mowing becomes difficult and dangerous, your sidewalks and driveways look messy, and your planting beds soon sprout weeds. After putting all that work into spreading mulch in your garden, the last thing you want to do is spend time raking it back in after every rainstorm! Here are some tips for keeping mulch in your planting beds where it belongs. Bark nuggets are notorious for floating across sidewalks. Chips and Nuggets: Wood chips and bark nuggets are infamous for floating away in heavy rain. If you go this route, get larger nuggets that will be heavier. Shredded Bark or Wood: Shredded mulch is a good choice because the pieces tangle and hold each other down. Look for medium or coarse ground mulch with a mixture of large and soft pieces. Hardwood mulches are heavier – and stay in place – better than softwood (pine) mulch. Pine Straw: Pine straw is my favorite choice because the needles entwine and help it stay put. For this reason pine straw is often used on slopes. Shredded hardwood mulch tends to cling together. If your garden is on a slope or has a tendency to wash out, avoid putting landscape fabric or plastic sheeting underneath your mulch. These create a nice slick surface for the mulch to slide right out of the bed. Instead, to keep weeds at bay, apply multiple thin layers of mulch, watering each layer to help pack it down. Block retaining walls can help hold mulch in place. 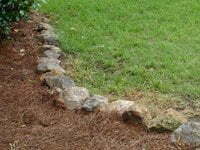 Landscape Edging: Wood, metal, plastic, or stone edging can help keep mulch in its place. Make sure the edging is several inches high. Plants: Edging plants make a great border to hold in mulch. Monkey Grass (Liriope sp. ), Hostas, and ground covers are great choices if planted closely together along the edge of the bed. 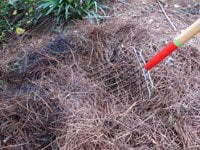 Pine Straw Edging: Gardeners who love their bark or chip mulch may have success by edging the beds with a foot-wide row of pine straw to catch floating nuggets. Trenching: A small trench (3-4” deep) around the edge of the flower bed can catch washed-out mulch before it gets into your grass. It’s easy to then rake it from the trench back into the bed. Edging with Mulch: You can also try piling your mulch deeper around the edges of the bed to form a low barrier that may keep it from washing as much. Wood border around flower bed. On steep slopes, you’re going to need to take additional measures if you want mulch to stay where you put it. Ideally, steep slopes should be terraced to create smaller, flatter areas that will hold soil and mulch in place. Terraces help create more garden space, too. Another option is to cover the mulch with bird netting, then use landscape fabric staples to hold the netting in place and keep the mulch from sliding downhill. On sloped areas, before applying or refreshing mulch, breaking up the dirt first helps in two ways. One – rainwater will soak into loosened ground more easily vs it will mostly run down the slope if the dirt is flat and packed down, taking the mulch with it. Two – mulch applied to a rougher surface will “stick” to the surface much better, with less tendency to wash down the slope. For smaller areas, dropping a shovel into the dirt in criss-crossing patterns will work to rough up the dirt. However, my lifesaver for this job has been my Garden Weasel. The tines move back and forth as they rotate, nicely loosening the soil about 3 inches down. Use on moist soil, or first hose down the soil yourself, as the moistened soil will much better maintain the peaks-and-valleys that help lock the mulch in place. I also use this tool to loosen up existing shredded mulch, which gets way too packed together over time, making it harder for water and air to penetrate it. Lastly, for landscaped areas next to your home, overflowing gutters are the sworn enemy of my mulch budget. Getting them cleaned out as often as it takes isn’t that much more expensive than constantly going to the store for mulch, plus forever weeding and watering dried-out plants if you don’t. What about using the pine straw first to help stabilize the bed, then adding some decorative cedar shavings for the popular “wood chip” look (and it is supposedly insect repellent)? I am going to try the plastic border set in and flowers all around the edge of the bed. The combination may help with weeds, moisture retention for the tree, and to make mowing easier. I love the flowers for looks, and I can either pick something that self seeds, or is perennial. Living in zone 9, all but one of my perennials lasted through the freezes last year. We have a mulch flower garden on the corner of our property. We have several dogs who keep digging up, not only the mulch, but also the flowers. Is there anything we can do. We tried Cayenne Pepper and it did not work! Thanks. You can put down an edging to keep the mulch in your garden or create a spot for the water to run out by putting down some stones. Watch the low spots in your garden and see where the trail of water goes. That is where the stones should go…..
How about lining the edge with plastic edging that is 1-2 inches tall and drilling holes in the bottom of the edging so that the water flows through it and not over? I’d probably drill at least one 1/4″ hole every inch if not more. Or…. an edge that is more mesh like to contain the mulch but let the water through. How can I keep pop up valve at end of French drain from floating away and down the street? Not much help here. I have already put in a plastic edging structure to keep the mulch in my garden. The flow of water during the huge storm just over flows the blockade. Does anyone know a way to stake down the mulch ? Great article, Julie! I use Mulch to stop weeds from growing, but I still often have this problem of it floating away. I’ll definitely try your pine straw trick this spring!